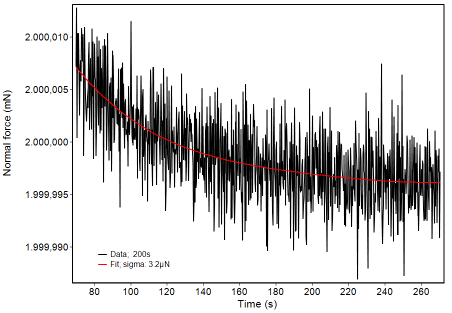 The standard deviation of the noise floor for an acquisition rate of 16 Hz is typically less than 0.3 nm for the displacement measurement and less than 3 µN for a force measurement with the 2 N head. This is the best what could be reached for such a sensor up to now. Smaller acquisition rates will further reduce the noise level. The level is slightly higher at the end of a measurement range. The big advantages of LVDTs against capacitive sensors consist in a significant larger measurement range of up to 1 mm (for the used sensor type) and a much larger overload protection. Because there are no limit stops like for capacitive sensors, it cannot be destroyed easily during overloading. This makes the ZHN heads so robust. Fig. 1 is showing the noise level for the maximum force of 2 N over a period of 200 s. In contrast to many other instruments the force signal is measured with a second sensor, completely independent on voltage or current of the actor. The standard deviation of the difference to a fit curve (red) is 3.2 µN. The slight curvature of the curve comes from the feedback control which is quite week for such small differences from the target value. Fig. 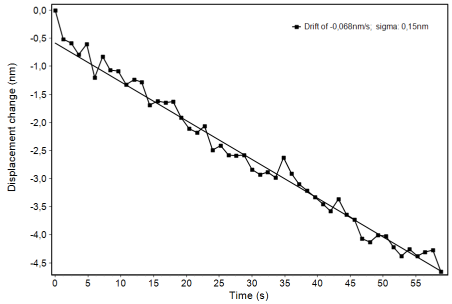 2 is showing the displacement signal during a hold period of one minute for the determination of thermal drift. For a smaller data rate the standard deviation of the displacement noise floor is only 0.15 nm. The thermal drift was -0.068 nm/s.